This concert of Amsterdam's Royal Concertgebouw Orchestra (RCO) at the Brussels Center for Fine Arts marked the inauguration of the Dutch presidency of the Council of the European Union. A feisty event, attended by both the Dutch and Belgian royal couples and a host of excellencies – which accounted for an impossibly 30 minutes late start, but also proved for a city still in the throes of terrorist activity aimed at our way of life, that things can be normal after all. And what better way is there to escape from grim-visaged reality than a concert with great music that sublimates our cultural achievements? 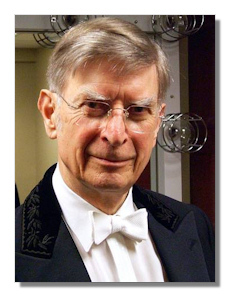 The RCO was conducted by the veteran Swedish maestro Herbert Blomstedt. At 88 years and 7 months Blomstedt is, incidentally, the oldest guest conductor in the history of the orchestra, even surpassing the legendary Pierre Monteux who was "only" 88 and 4 months. Not that anybody would have been aware of this, because the vivid and impish personality of the Swede totally belied his age just as much as his music making. Conducting without a baton, and for most of the concert, from memory, Blomstedt offered a finely contrasting program with two popular works, Wagner's Tristan and Isolde and Dvořák's "From the New World", framing a modern rarity (although "modern" here is already well over 50 years old too) Poesis from the Swedish composer Ingvar Lidholm (b. 1921). While the orchestra was being rearranged, Blomstedt undeterred by the presence of royalty, picked up a microphone and introduced, in an often hilarious manner – vocal imitations and his familiar reference to mushrooms haphazardly growing in the forest and all – Ingvar Lidholm's piece Poesis. Composed for the 50th anniversary of the Royal Stockholm Philharmonic in 1963 and premiered by Blomstedt the following year, its experimental and seemingly chaotic modernity stood in stark contrast to the melodious, organized world of the preceding Wagner. Poesis remains a striking 20-minute sonic exploration, with startling crescendos and virtuosic solos, often challenging the orchestra to extremes and creating sound in unconventional ways, like dropping the lid prop of the piano or rustling sandpaper. Blomstedt clearly adores the work and just as in Tristan he was able to inspire the RCO musicians to sound their best. In the end, Poesis was a great deal of fun, with in particular superb solo passages from piano (Jeroen Bal), double bass and percussion. Dvořák's Ninth received an elegant but powerful, and often stunningly beautiful reading. Tempi were well-judged throughout, dynamics were controlled, yet if there was an emotion that Blomstedt was willing to share it seems to have been one of joy. I don't recall hearing such an optimistic, sunny reading of the opening Allegro molto with lightly sprung rhythms, delicate textures and deft phrasing. Even the Largo, swiftly but attractively played, didn't linger too much on melancholy or longing. This was mostly happy Dvořák, the "New World" symphony as a masterful continuation of In Nature's Realm, admiring nature in all its richness of color and tones. The closing movement, with irresistible drive, was a logical culmination of joy. And how many times can you hear such a tight ensemble, such well-judged orchestral balance and transparency, and such colorful instrumentalists? The RCO brass, particularly the horns, were simply glorious.